In the photo: Lisa Woodcox of Chandler Park, left, and David Graham of the GAM, teamed up to get donating golfers to spin the prize wheel. 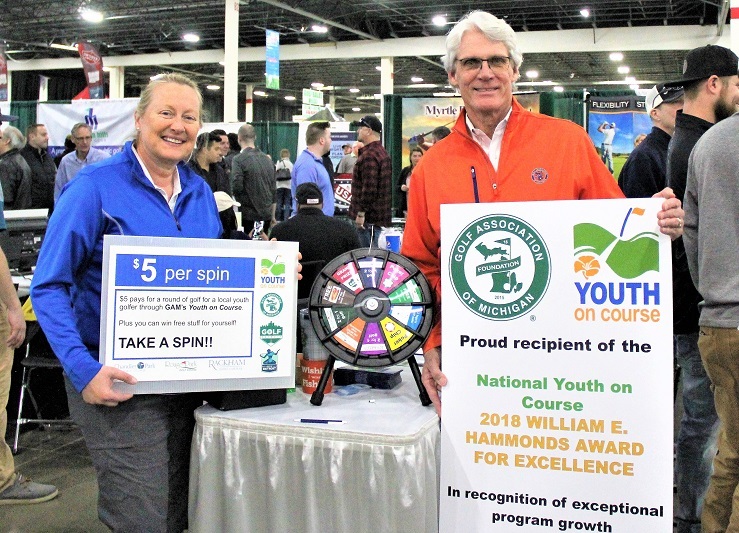 NOVI – Golfers were donating $5 and spinning a prize wheel to win things like two-for-one golf coupons while at the same time making it possible for youth golfers to play free this summer with some help from Golf Detroit and the Golf Association of Michigan. 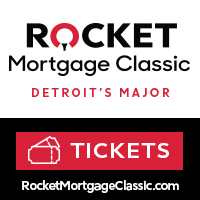 Golf Detroit, which includes the city-owned Chandler Park, Rouge River and Rackham golf courses managed by Signet, teamed up with the Golf Association of Michigan’s GAM Foundation and its association with the national Youth on Course program at the recent Michigan Golf Show. Well over 100 free rounds will be played for free this summer on the city courses thanks to the golfers who stepped up, donated $5, took a spin and won. "We are fortunate in the Detroit area that there are a lot of wonderful youth golf programs, like Swing for Dreams that we shared a booth with this weekend, and while those great programs teach kids how to play golf, learn life skills and core values, those young people need to then get on a golf course,” said Lisa Woodcox, the general manager at Chandler Park. The national Youth on Course program allows youth ages 6-18 to play golf for just $5 or less at participating courses. David Graham, the Golf Association of Michigan’s Executive Director, came back from a 2015 Northern California Golf Association Foundation presentation with knowledge of a growing the game initiative that was working. It was Youth on Course. Two years ago, the GAM became the first regional golf association east of the Mississippi River to support the initiative. 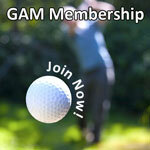 Under the GAM Foundation Youth on Course Program golf facilities that choose to participate are subsidized. For each $5 round they receive the difference between the $5 paid and a contracted junior rate, which on average is about $8 per round. Woodcox said the goal was to reach $500 or 100 rounds during the golf show, and they had passed that mark by Saturday afternoon with Sunday’s show day remaining. In the GAM Foundation’s second year in 2019 with the Youth on Course program over 4,500 youth participated and played almost 6,000 rounds at 93 participating Michigan facilities. Nationally, Youth on Course, a non-profit, reports they are in 26 states and in 2018 there were 992 golf courses involved with over 150,000 rounds being played by nearly 50,000 youngsters. In addition, a scholarship program now gives away $250,000 to YOC member golfers annually. The GAM Foundation, just recently, won the William E. Hammonds Award for Excellence from Youth on Course for its exceptional progress in growing the program by attracting more members and member clubs. “Youth on Course at the Detroit schools is truly a game-changer, and it is very supportive of what we do as a foundation, and as an association that has now been around 100 years,” Graham said. “It will build a bridge to get more people to play golf, more kids out to have those ah-hah moments. 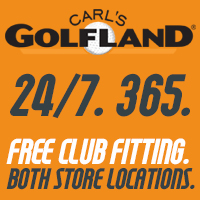 “When you think of the kids in difficult economic situations near these golf courses, now there is an opportunity for them to get out and play. I grew up playing Chandler Park. I have wonderful memories. It was a great starter field for me, a great place to go out and play, learn the game, hit a couple of shots that were worth remembering and so I think it is perfect fit having the Detroit courses to be engaged with us. For more information click on the Youth on Course tab on this website. For more about the GAM Foundation, click on the Foundation tab. For more information about the Detroit golf courses go to golfdetroit.org.